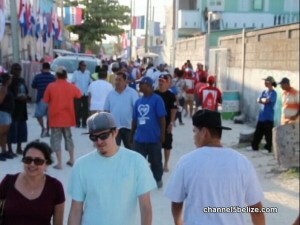 After the first court hearing on the controversial results of the 2018 San Pedro Town Municipal Elections on Wednesday, March 28th between the San Pedro United Democratic Party (UDP) and the San Pedro Peoples United Party (PUP) at the Supreme Court in Belize City, the case was scheduled to be heard on Monday, May 14th and Tuesday, May 15th. On Monday at the first hearing, witnesses from both parties and government are expected to be present and speak on the information that has been submitted. A verdict is expected to be delivered the following day. Regardless of what the Supreme Court decides, PUP party leader Honourable John Briceño has stated that they will accept and respect whatever decision is made. While the trial was ongoing, a handful of PUP supporters were in front of the Supreme Court Building protesting the elections results. 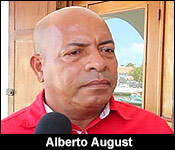 Persons like Santos Acosta believe that the elections results in San Pedro Town do not reflect the political will of the San Pedro community, an assertion which the UDP and its Chairman Alberto August refute. Santos and about fifteen other persons presented themselves with placards in hand to support the PUP’s claim, which August says is a waste of the court’s time. Reporter: What would you have to say if someone told you that the claim that the supposed discrepancies found were based on unofficial numbers and not official numbers. Alberto August, Chairman UDP: “Just looking at the face value of the evidence presented so far it looks to me without seeking to prejudice the outcome of the case it seems to me like it’s just a waste of time. We are dealing with numbers, one and one is equal to two, basically I am seeing it like they are putting these people on the stand and they are taking them for fools on the stand. 2 and a half months ago, we told you about the election petition that the PUP had filed to up-end the municipal election results in San Pedro. Well, just after the start of news tonight, Chief Justice Kenneth Benjamin adjourned the first day in the full hearing of this petition. As we reported, Incumbent Mayor Daniel Guerrero and the UDP 7 held unto their seats in the island town by a small margin. PUP's Mayoral Candidate Abner Andre Perez and the councillor candidates from the PUP 7 team say that there is a discrepancy of 275 ballots from polling station #37. Their party scrutineers cross-checked the numbers they had, and when they compared it with the figures from Elections and Boundaries officials on March 7, they came to the conclusion that these 275 ballots were not properly accounted for. Given the small margin of victory, they believe that these 275 ballots in dispute could have affected the outcome the results of the election in San Pedro. So, they are asking Chief Justice Benjamin to declare the elections null and void. They're being represented by Attorney Eamon Courtenay. 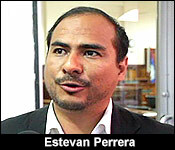 Incumbent Mayor Daniel Guerrero and the councillors in dispute are being represented by attorney Estevan Perrera. Chief Elections Officer Josephine Tamai, and San Pedro's Returning Officer Catherine Cumberbatch are being represented by Solicitor General Nigel Hawke. Cumberbatch, who you'll remember is the Chief Meteorological Officer, was the lead election official in San Pedro in the March 7 Municipal Elections. Most of today's hearing was focused on taking sworn testimony from the PUP's representatives who were responsible to keep a close eye on the election for them. 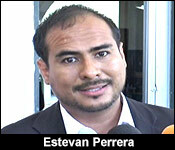 Mayoral Candidate Abner Andre Perez was also called to testify. Those happened in the morning, and in the afternoon, Josephine Tamai and Catherine Cumberbatch were rigorously cross examined by attorney Eamon Courtenay. 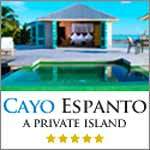 "The case was brought by the petitioners who called their 3 witnesses to testify. The case is whether or not the election was conducted in accordance with the town council regulations and act. The witnesses we called, we believe gave evidence to show very clearly that there was a non-compliance with the law. A number of these incidents of non-compliance was actually confirmed by the returning officer Miss Cumberbatch and by the chief elections officers and their witness Mrs. Flowers. What is left now is for us to give submissions to the chief justice and what we will attempt to do in our submission is to persuade the chief justice that the irregularities which we have identified, irregularities which they admitted, you heard Mrs. Cumberbatch telling you that she had to correct a lot of the paper. We had the amazing confession from the corrections and boundaries commission that after the elections they in fact had the balance and opened the envelopes and counted the ballots. That is not in compliance with the law but the point is that all of these irregularities we say are sufficient to ask the chief justice to say that the elections must be re-held. Ballot box C-A is one of the most important pieces of evidence. What happened there is that there were 675 voters and 675 ballots were made available. There were 800+ voters in C-A. At the end of the balloting they only put on the form 400. The question was where is the additional 275 ballots. What they did, this is the point we are making to the chief justice, what the elections and boundaries commission and Mrs. Cumberbatch in particular did, they realized this mistake and simply put on the form, oh strike out the numbers and add 275. Change and say it is accurate. I pointed out to Mrs. Cumberbatch, you can only certify that if you went yourself and checked the actual ballots and said yes 275 ballots were accounted for and then put it on the form. She did not do that and therefore her certificate of correcting it in our submissions cannot be relied on that. Its juts a mathematical correction to try to reconcile what they had on paper. In this case it is not about mathematics. It's about the politics and the vote." "Sir do you dispute any assertion from any party that this particular competition is frivolous and vexatious?" 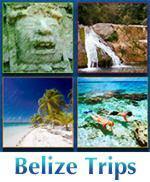 "Anyone who says that, I believe is being politically partisan and not legal. We are now in court and not in the political arena." "PUP have said that they believe that this case is going very well for them that certain important admissions and clarifications came out in testimony came out today which helps them in their case. Do you agree or disagree?" "I actually disagree with that statement. You were in the court as well, this morning we found that the witnesses for the petitioners actually had more admissions in support of our position. 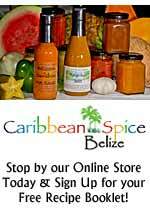 We believe that the case is actually sided in our benefit at this point in time." "Do you think that this particular petition is frivolous?" "Yes I do believe its frivolous and I do believe that anyone who looks at the actual petition and the numbers will recognize that there was an error and an oversight in terms of minor miscalculations that were later remedied and that it's not sufficient enough for court to set aside an entire election based on the facts or position presented by the petitions. We're saying that the reported errors are so minor that simply by looking at the forms, one can actually make those corrections and recognize where those errors were made on the actual forms." 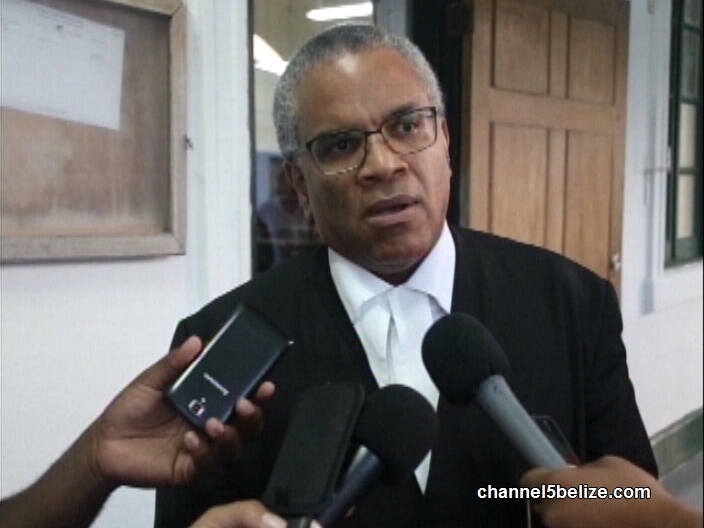 Chief Justice Benjamin has adjourned the case until May 28. 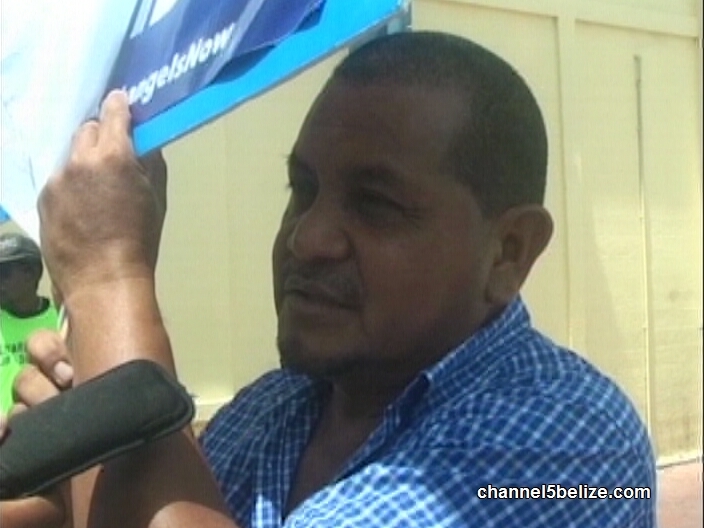 A first of its kind election petition was heard in the courtroom of Chief Justice Kenneth Benjamin today between the slates of the two major political parties, who contested the March election in San Pedro Town. 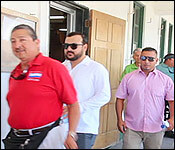 It pits United Democratic Party incumbent Daniel Guerrero against his People’s United Party rival Andre Perez, as well as the Chief Elections Officer, returning officer for the election Catherine Cumberbatch, and others. Guerrero edged out Perez by only thirty-eight votes in a hotly contested race that looked to be in the P.U.P.’s favor in the early going. But the blue cried foul, alleging multiple irregularities in the handling and reconciling of ballots that, as presented by Senior Counsel Eamon Courtenay, constitute reasonable doubt as to the proper conduct of the election. This afternoon, presiding officer Desiree Flowers admitted that she, during reconciliation of ballots, wrote down three hundred and seventy-nine as the number of ballots used instead of three hundred and fifty-nine, an error not witnessed by P.U.P. scrutineer Alex Noralez before he signed off on the document. But she insisted it was just an error, though could not say why the mistake was made. Perez and his team also claim that as many as two hundred ballots were not accounted for. 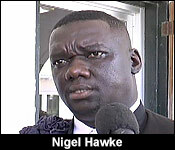 But Solicitor General Nigel Hawke forcefully argued to him that he could show no proof of that from the official documents of the Election and Boundaries Department. 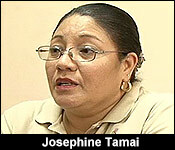 Also testifying was Chief Election Officer Josephine Tamai, who oversaw the entire election process. At this hour, returning officer Catherine Cumberbatch is on the witness stand. 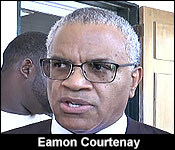 The case closed at around six-thirty and attorney Eamon Courtenay provided comments. 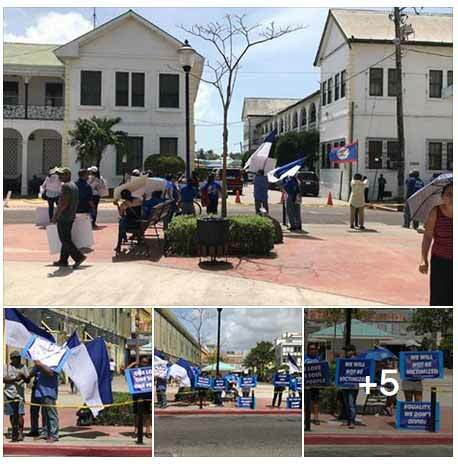 The March 7 national municipal elections have come and gone, and all the elected municipal bodies are functioning, except for the United Democratic Party (UDP) Town Council in San Pedro, which is facing a legal challenge in an election petition about its legitimacy. 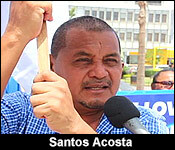 In the election, the UDP mayoral candidate Daniel Guerrero won with 2,667 votes while the PUP mayoral candidate Abner Perez received 2,629 votes. 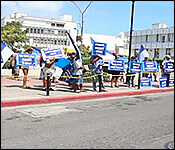 This morning, a group of PUP supporters from San Pedro gathered in Battlefield Park, in front of the Supreme Court buildings on Regent Street, clutching their signs of protest as their party’s election petition got underway in the biggest courtroom in the country, which was packed to capacity, with standing room only. 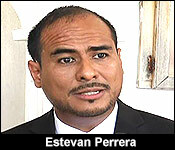 Late this evening, witnesses concluded their testimonies in the Supreme Court of Chief Justice Kenneth Benjamin, who is hearing an election petition that was filed by the Opposition People’s United Party, which is asking the court to set aside the results of the March 7 election and order new elections for the San Pedro Town Council. 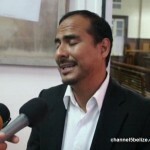 The election petition will continue on Monday, May 28, when the parties will make final submissions before CJ Benjamin. 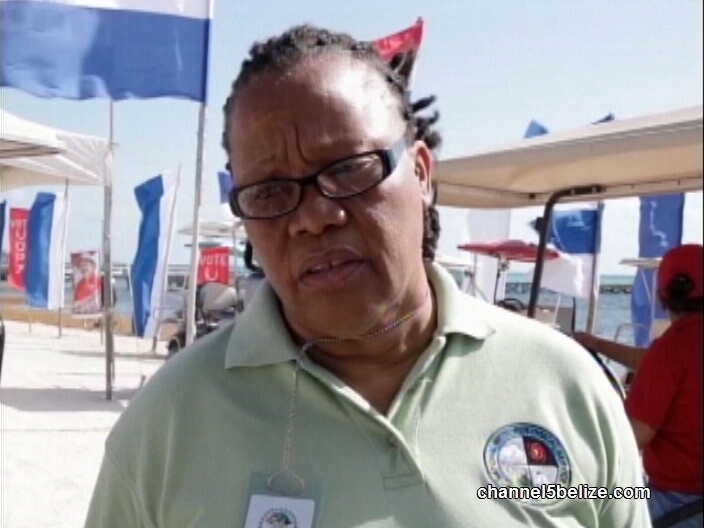 The last witness to take the stand today was Chief Meteorologist, Catherine Josephine Millicent Cumberbatch, who was the Returning Officer on San Pedro and who had given a witness statement in the election petition on April 23. The election petition was filed by the PUP San Pedro Town Council slate, which is represented by attorney Eamon Courtenay, S.C. against the 7 members of the UDP San Pedro Town Council, who are being defended by attorney Estevan Perrera. 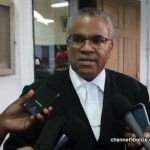 The Attorney General is also named as an interested party in the election petition, while Returning Officer, Catherine Cumberbatch, has been named as an eighth respondent. Cumberbatch and the Attorney General are being defended by Solicitor General Nigel Hawke. Cumberbatch, Chief Elections Officer Josephine Tamai and Presiding Officer Desiree Flowers all admitted to various irregularities under intense cross-examination from Courtenay. Tamai, under cross-examination from Courtenay, admitted that no one was present when she opened the bag with the ballots from San Pedro. Tamai said the counting took place at her office for the unused ballots. When she was asked where the ballots are presently, Presiding Officer Flowers replied that she had no idea where the ballots are. Flowers admitted that there was some discrepancies with the number of ballots and that where there should have been 359, there were instead 379. Flowers told the court that the Returning Officer certified that there were 41 unused ballot papers, but that figure was wrong, she admitted. Cumberbatch admitted that after the polling had ended, she was not present at the table when the counting began. Cumberbatch also said that an unsealed and unlocked box was handed to her. “All the ballot papers, used and unused ballot papers were put inside that box. I did not check the box; Ms. Flowers locked the box and gave me the key,” she stated. Cumberbatch said the ballots reached the Chief Elections Officer Tamai on March 9, two days after the elections. Cumberbatch said that all the documents were taken out of the box and placed in a garbage bag, and the box was left in San Pedro, and she told the court that she didn’t recall how long the handing-over to the Chief Elections Officer took. Tamai had said under-cross examination that the hourly count that the Elections and Boundaries Department was posting on its website was not important in the overall scheme of things. 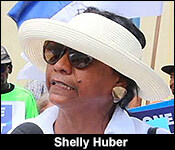 Cumberbatch, however, said that she created a spreadsheet in Excel to document the hourly voting count that she was getting from the 17 presiding offices at the polling stations on San Pedro. Cumberbatch also admitted that the number of ballot papers used was incorrectly stated and that she had corrected the number. Following the hearing, Courtenay told reporters that the case was brought by the petitioners, who called their three witnesses to testify. The case was based on whether or not the elections were conducted in accordance with the Town Regulations and the Town Council Act. Courtenay went on to explain that what is left now is for them to give submissions to the Chief Justice. “And what we will attempt to do in our submission is to persuade the Chief Justice that the irregularities we have identified, irregularities which they have admitted — you heard Ms. Cumberbatch telling you that she had to correct a lot of the papers — we had the amazing confession from Elections and Boundaries Commission that after the elections, they in fact had the ballots and they opened the bag and counted the ballots, is not in compliance with the law,” he said. Courtenay said that with all that, they hope to convince the Chief Justice that elections must be carried out again in San Pedro. Courtenay was asked if he disputes any assertion from any party that their petition is frivolous and vexatious. “Anyone who says that, I believe is being politically partisan and not legal. 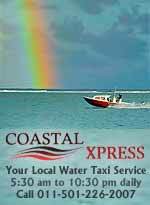 We are now in court, and not in the political arena,” Courtenay replied. “What about ballot box CA and the 275 missing ballots”, Courtenay was asked. “What happened there is that there were 675 ballots that were made available. I think there are 800 and something voters in that area. At the end of the balloting, they only put on the form 400. The question is where is the other 275 ballots? “What they did, and this is the point we are making to the Chief Justice, what the Elections and Boundaries Commission, and in particular Ms. Cumberbatch [must do], is to realize this mistake and simply put on the form, strike out the numbers and add 275 and say, oh, that is accurate,” Courtenay explained. “Ms. Cumberbatch would have had to have gone and checked the ballots herself to say 275 was actually accounted for, and then put it on the form. She did not do that, and therefore her certificate of correcting it cannot be relied on. That is just a mathematical correction to try to reconcile what they had on paper”, Courtenay said. Courtenay was asked if it was proper for the Chief Elections Officer to take the ballots and count them at her office. “The law is very clear. They should have been sealed by the returning officer and should not have been opened unless they were brought to court, by an order of the court”, he said. 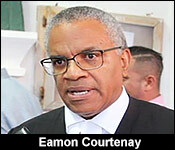 “We have now no confidence as to where those ballots are, the status of them, or whether they are all accounted for, and that is an issue which we will be addressing the Chief Justice on,” said Courtenay. Last night, we took you to the Supreme Court for the PUP's petition against the San Pedro Election results of March 7. 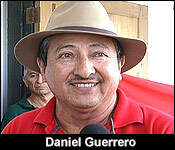 You'll remember that the election ended with UDP's Mayor Daniel Guerrero and the UDP 7 being declared as winners. 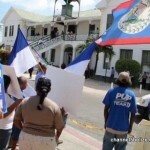 The PUP wants the Chief Justice to set aside those election results, and order a new election for the island town. UDP's like the incumbents from the San Pedro Town Council, and Chairman Alberto August think that the PUP's challenge to the March 7 Election results are a complete waste of time. "It looks to me, without seeking to prejudice, of course, the outcome of the case - but it seems to me like it's just a waste of time. We're dealing with numbers. 1 and 1 is equal to 2. I am seeing it like they are putting these people on the stand, and they're taking them for fools on the stand." "While that's your position, there are those who are concerned the UDP's are simply trying to discredit complaint because you all stand to lose if the court rules against you all." "Well, not exactly, like I said, it's up to the judge to make that decision." It's the same reasoned position that the UDP's attorney shared with us after day one in the trial. "I do believe its frivolous and I do believe that anyone who looks at the actual petition and the numbers will recognize that there was an error and an oversight in terms of minor miscalculations that were later remedied and that it's not sufficient enough for court to set aside an entire election based on the facts or position presented by the petitions." And he gave us a brief synopsis of why he thinks Returning Officer Catherine Cumberbatch and Chief Elections Officer Josephine Tamai both made mistakes which gives the PUP complaint credibility. "The witnesses we called, we believe, gave evidence to show very clearly that there was a non-compliance with the law. A number of these incidents of non-compliance was actually confirmed by the returning officer, Miss Cumberbatch, and by the chief elections officer, and then again by their witness, Mrs. Flowers. Ballot Box (CA) is one of the most important pieces of evidence. What happened there is that there were 675 ballots that were made available. I think that there are 800+ voters in that CA. At the end of the balloting, they only put on the form 400. The question was where was the additional 275 ballot. What they did - and this is the point we were making to the Chief Justice - what the Elections and Boundaries Commission, and Miss Cumberbatch, in particular, did was that they realized this mistake, and simply put on the form, oh, strike out the numbers, and add 275. Change around the numbers and say, oh, that is accurate. And I pointed out to Ms. Cumberbatch, you can only certify that if you went yourself, and checked the actual ballots, and said, yes, 275 were actually accounted for, and then, put it on the form. She did not do that, and therefore, her certificate of correcting it, in our submissions, cannot be relied on. That is just a mathematical correction to try to reconcile what they had on paper. This case is not about mathematics. It's about the politics and the votes. And the question is, what were in those ballot envelopes with the ballots? And she didn't count them, so she can't testify to their accuracy." 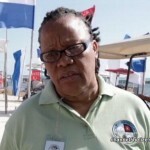 "When it comes to the Chief Elections Officer's handling of the ballots and taking it to her office, is that proper? Is that correct?" "I think the regulations are very clear. Once those ballots have been counted, the presiding officer should seal the envelopes, hand them to the returning officer, in sealed envelopes, and the law is very clear that they should not be opened until and if they are brought to court by an order of the court. And we have the Chief Elections Officer with her own mouth, saying that she opened them, and she counted. We have, now, no confidence as to where those ballots are, the status of them, whether they're all accounted for. The point is that all of these irregularities, we say, are sufficient to ask the Chief Justice to say that the elections must be re-held." As you've realized, the legal team intends to register each and every single infraction that they think the E&B officials committed in the San Pedro elections. The supporters from island town are behind them 100%. We found them demonstrating against the elections in the broiling sun hot. "The sun is hot. Do you guys intend to stay here the entire time that the case is on?" "That is the case. As you can see, we're standing for our rights. We're standing for what we believe in." "When we went for elections, they went and vote their rights, and we did not expect that they were going to be so blatant in stealing the elections from us." "But, ma'am, I have to challenge you. You say "steal", but there is no determination of that yet. That's why it's in court." "That is why it is in court, because the same people that were running the Elections and Boundaries, they have seen a lot of discrepancies." 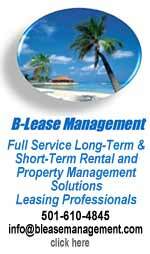 "Litigation is a risk. There is a very chance - just like there is a big chance that you can win, you can also lose. Do you acknowledge that?" "Yes, we understand that the case my go against us, but you know what? Again, let me say what the sign says, "Stand for something". And that's what we're standing for. We're standing for legality, and we're standing for the rule of law." And the UDP attorney in this case wants them to suffer the full consequences of that litigation risk. "This morning we found that the witnesses for the petitioners actually had more admissions in support of our position. 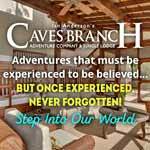 We believe that the case is actually sided in our benefit at this point in time. We're saying that the purported errors are so minor, that simply by looking at the forms, one can actually make those corrections, and recognize where the little errors were made on the actual forms." As you saw in our story, both sides were asserting that they won the day. The chief Justice has adjourned this case for continuation on May 28. 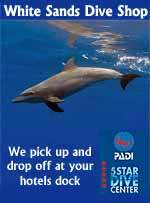 We'll be there to tell you how it goes. Earlier in the week, we gave you in depth coverage of the PUP's challenge to the March 2018 Municipal Elections in San Pedro. The PUP 7 of that island town is hoping that the Chief Justice will declare those elections void, and that new elections would be called. As we told you, the PUP is complaining specifically about the manner in which the officials of the Elections and Boundaries Department carried out the election. They say that there were major discrepancies, which calls the result into question. The two Elections and Boundaries officials being sued in this election petition are Catherine Cumberbatch, who was acting as the returning officer in San Pedro on that day, and Chief Elections Officer Josephine Tamai. You'll remember that in the interviews on Monday evening, PUP Attorney Eamon Courtenay questioned Tamai's handling of the San Pedro Ballots. "When it comes to Chief Election Officer handling of the ballots and taking it to her office, is that proper? Is that correct?" "I think the regulations are very clear once those ballots have been counted the presiding officer should seal the envelopes hand them to returning officer in seal envelopes and the law is very clear that it should not be opened until and if they are brought to court by an order of the court and we have the chief elections officer by her own mouth saying that she opened them and she counted them. We have now no confidence as to where those ballots are, the status of them whether they are all accounted for and that is an issue which we will be addressing with the chief justice." "I'm very reluctant to comment on an issue that is currently before the courts, but nonetheless I must let the public know that the information that is being circulated in the media in terms of myself Josephine Tamai as the chief elections officer counting ballots after San Pedro elections is totally false. It's a lie. I have never opened any envelope to count any ballots that were used in the San Pedro elections and I just want the persons to know that because like I said you keep hearing different side of the stories and I believe that I must clear my name. I have been the chief elections officer for some time now and I have conducted several elections and I know what is my duty and what is my role and I also want for the public know that the law does give the authority for the chief elections officer to have custody of those ballots. So again, if persons believe that the chief elections officer should not have any custody of those ballots the law gives the chief elections officer to keep those in safe custody." The case is scheduled to continue on May 28, and we'll be there to tell you what happens next with this petition. The PUP wants the court to throw out the UDP's victory in San Pedro in the March Municipal Elections. 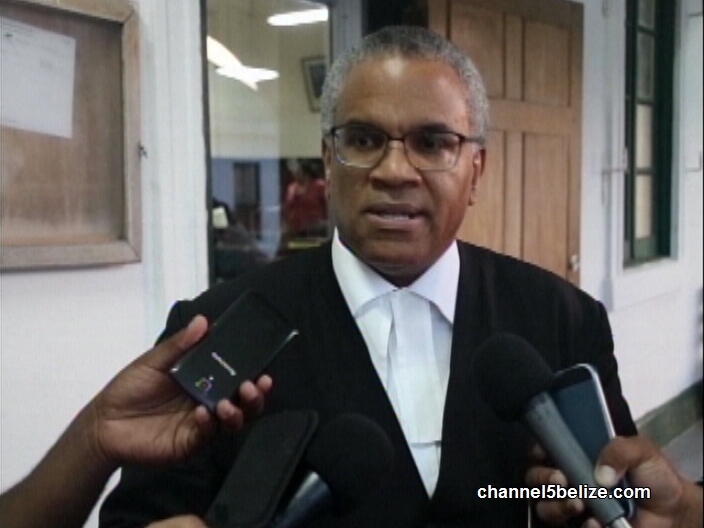 Well, today, Chief Justice Kenneth Benjamain listened to submissions from the attorneys for all the litigants as to why he should or should not uphold the petition. Tonight, the case is in his hands for a decision that should arrive in about 2 weeks' time. The PUP 7 Municipal Slate from San Pedro alleges that there is a discrepancy over the total number of ballots from polling station #37 in the island town. They say that 275 ballots are not accounted for, and that those could have drastically affected the outcome of the elections, since Incumbent Mayor Daniel Guerrero and his team won by only a small margin. You'll remember that at the last hearing, there was a 7-hour marathon of evidence taking and cross examination, where key witnesses such as the PUP's election scrutineers from San Pedro, Chief Elections Officer Josephine Tamai, and Returning Officer Catherine Cumberbatch, were all grilled about what they know, what they saw, and what they did on election night and after that. Well today, the judge listened to the attorneys for the PUP 7, the Solicitor General, and the UDP 7's attorney presenting their interpretation of evidence and why it supports their positions. Now, depending on who you talk to, the 2 sides were claiming victory in the lawsuit for themselves. "We highlighted for the Chief Justice what we regard as a number of major irregularities, violations of the law. The first is, of course, the fact that the ballots and the papers related to it were unsealed, first by Miss Cumberbatch, because as you know, she changed the numbers on all of these papers, and then secondly by the Chief Elections Officer. We believe that the law is very clear. Regulation 84 and Regulation 89 prohibits and proscribes anyone from tampering with ballots and/or election papers after the counting is completed. And these were gross violations. Beyond that, the Chief Elections Officer was very clear that she and Mr. Zuniga counted the ballots when Miss Cumberbatch handed them over to her, and that nobody from the People's United Party was present. That is an absolute flagrant violation of the law, and what it does is that it undermines the integrity of the electoral process. My learned friends suggested that this type of violation is acceptable. That type of violation is minor; it is trivial, and the court should tolerate, and saying that the people in Battlefield Park would live with that type of treatment of an election. Well, as we submitted, we in the People's United Party do not accept that the Chief Elections Officer - or anyone else, for that matter - should have access to the ballots, and the papers, after the election. We in the People's United Party reject completely the notion that you can open the ballot papers, and open the envelopes, and take out the things, and deal with them, tamper with them, after we have left the counting room. That is, in our view, a violation of the basic tenets of Belizean democracy, and we are hoping that the Chief Justice accepts that those violations are significant, they're substantial, and enough to void the election." "The matter is before the court for deliberation now. So, I can't comment much. What I will say is that we made our submissions. Our submissions are fundamentally based on the fact that they are challenging the results based on ballots that are unaccounted for, when the evidence suggests, by their own witnesses, that used ballots have been accounted for. So, we say that there is a great paradox here. Why did they bring the petition, if they accepted that the ballots used determines the results? But, we have to wait for the judgement of the court." 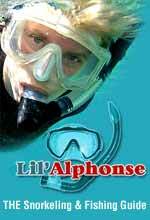 "The onus remains on the petitioners themselves. They are the ones who are supposed to prove what they say occurred, if anything did occur. Now, our position is simple. Simply because the petitioners said that a fire exist, doesn't make that so. They have to prove it to the court. They have to show, and they have to provide evidence of this. We are saying that they failed to provide any evidence clearly substantiating their position that a fire did in fact exist. We're saying that there was no irregularity. There were minor miscalculations in the form, like what we had informed you previously. And we're saying that the law contemplates that there will be errors done by persons at the counting because of the time that it takes place, the amount of events or actions happening therein. And so, it is expected that there will be some minor errors, and that's why the law is very specific. It says that minor discrepancies or errors does not invalidate the actual election." 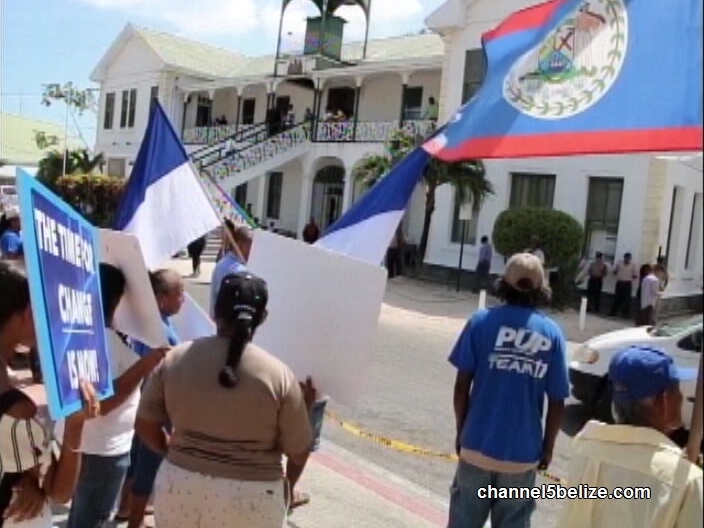 After several court hearings at Supreme Court in Belize City regarding the controversial results of the 2018 San Pedro Town Municipal Elections, the United Democratic Party (UDP) was declared victorious over the People’s United Party (PUP) on Friday, July 20th. At the March 2018 municipal elections, current UDP Mayor Daniel Guerrero received 2,667 votes, while PUP mayoral candidate Andre Perez tallied 2,629, giving Guerrero a slim victory margin of 38 votes. However, soon after, the results were contested, with the PUP alleging multiple irregularities in the counting and reconciling of the ballots and claiming that over 200 ballots were unaccounted for. 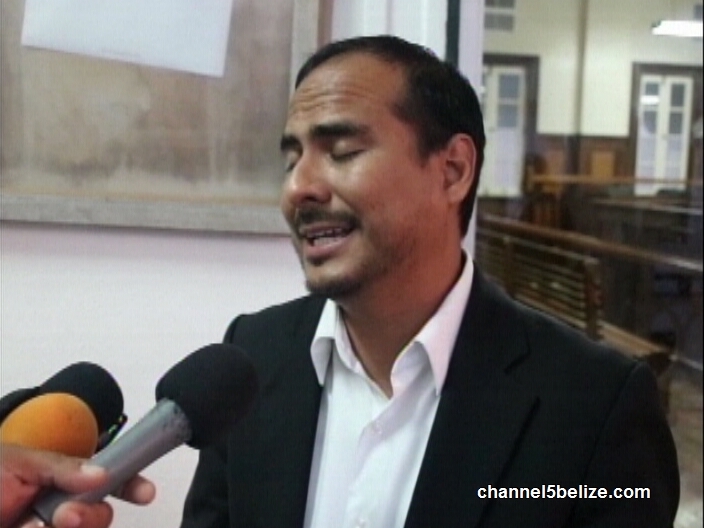 The San Pedro UDP refuted the allegation, and after Perez and his team sought legal advice they filed the case at the Supreme Court, a first in the history of Belizean politics. The PUP failed to convince Chief Justice Kenneth Benjamin that he should set aside the March 7 Municipal Election results in San Pedro. That means that Incumbent Mayor Daniel Guerrero, and the UDP 7 will be allowed to hold on to their council seats in the island town. That was the decision that the Chief Justice handed down today after almost 2 and a half months of deliberation. 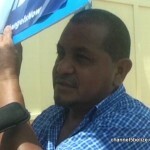 The PUP Mayoral aspirant for San Pedro, Andre Perez, and his PUP 7 team, challenged the results of the election on the premise that there was supposedly a discrepancy of 275 ballots from polling station #37 on the island town. Because the margin of victory was so small for the UDP slate, the PUP felt that they had a strong case to convince the judge to set aside the results of the election, based on this discrepancy. On the other hand, the UDP side argued that there were small errors of computation and those could not have drastically changed the outcome. After reviewing all the evidence submitted to the court, Chief Justice delivered an oral version of his decision, agreeing with the UDP that errors were committed, but that these errors are not enough to void the entire election. With that, he dismissed the petition and affirmed the March 7 results. "It's actually in our laws that it is expected that there are going to be certain errors and minor miscalculations on election day. It's expected and it's understood and it actually provides for that and it states that only if those minor errors or if those errors are substantial and if they would affect the ultimate outcome of the election would a court set it aside. And the persons who drafted the act were very clever, because they expected the fact that there would be errors, because we are all humans and so those minor errors that they brought about as we maintain from the start, were so minor that it did not affect the ultimate results of the elections. The votes were as they are. The numbers remained as they are and there were nothing on toward that would have suggested or affected the number of votes that each one of the candidates received and because of that, the court made this judgement solidifying that section of the act and stating that the minor errors which we pointed out were not sufficient in this case to put aside the election." "You feel that this is a moral win or just a legal win?" "This was both a moral and legal win. As we have always maintain from the start, we don't believe that the petition had any merit to it, because by the simply looking at the forms, one could easily recognized where the miscalculations were." "From day 1 we knew that the people's wish was to elect a UDP town council and it just has been proven today that it was a very valid election and here we are. It's a second win for the United Democratic Party, so we have defeated the People's United Party twice and I also must apologized for the PUP bringing the public officers to the courts, actually throwing them under the bus. I think they did an excellent job. But yet we still prove them on a democracy, on a system that works and the Supreme Court ruled in our favor." "Do you take notice of the fact that your opponents came within striking distance, less than 100 votes, the margin was small and you could have easily been the one who's out of office right now?" "They came pretty close. Every election is different and the outcomes are always different. The thing is that we still won. A win is a win. It doesn't matter how close it comes. It could have been by 1 and it's still a win." "That's the decision the judge has ruled and we have to respect. However, the underlying factor we need t look at is that we cannot forget that serious errors were made during the process and that was acknowledge by the judge. And we from the People's United Party want to thank our voters as well for supporting us and at the same time want to know as well that we did our part in fighting and ensuring that fair elections are being held and democracy, which is the key word is preserved and that is why we felt that we gave a good fight. We never gave up. 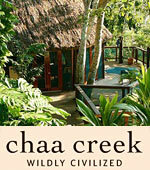 We felt that our rights were violated and that is why we found on that premise." "Should one look at this and say okay, well the PUP wasted the court's time?" "Not at all. I shoot that down then and there. We had a responsibility at the very beginning until now. Let's not forget, I go back to what the judge said that many errors were made and this needs to be a learning lesson and we need from a party and the nation has to be vanguard. Because although we still remain convince that errors still can affect the results, we must be on the lookout for the entire nation. I think a lesson has been learnt. So anything for it to be saying that this is all a waste of time. I shoot it down. Plan and straight." "We remained convinced and more than sure that the People's United Party in San Pedro, the residents living in San Pedro voted overwhelmingly for the full PUP 7 and we go again to tie it together with what is happening right now - the re-registration. It is clear and evident and it's especially after this court case that everything came to light, that more than a thousand voters that lives outside of San Pedro came to vote. With all that said the margin was very close to almost 38 votes. We cannot forget that and everybody knows and even the UDP, the present government in power, know that the residents of this town didn't vote for them. They wanted a change and we cannot forget that. We bring closure today, but a message has been sent and I think the entire nation listening is clearly watching that we the People's United Party is not going to layover and rollover. It is a message here sent and we fight and we carry on and here I stand today declaring myself as offering myself as candidate for the People's United Party." The PUP's have not indicated publicly if they will now concede victory to Mayor Guerrero and his team, but the UDP's attorney, Estevan Perrera, hopes that "good sense will prevail", and that this is now the end of this petition against the election results. No one from Courtney Coye's Law Firm, which represented the PUP in this petition, showed up for the results. We understand that Eamon Courtenay is out of the country. 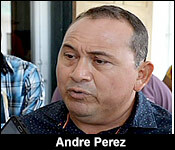 Notably, Andre Perez is already offering himself as a candidate for his party's standard bearer in Belize Rural South.